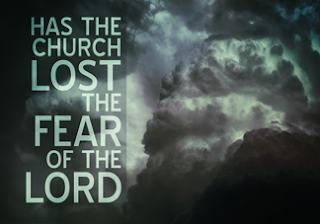 Salvation And Survival: What Has Happened To Our Fear Of God? What Has Happened To Our Fear Of God? I know I am not the only one who is receiving new and previously undiscerned perceptions of the Nature of our Lord Jesus. So, what I am about to share has been carefully gleaned from Scripture and reflects how He is widening and stretching my field of vision, so to speak, and allowing me to see a bigger picture of Him through God's Word. And I'm afraid that what I am about to write will be met with resistance by many in today's Church. But I hope you will read with a heart to receive and accept the Word of God. I'm sure that some of you will be way out in front of me on these revelations, while others may not be as far along the path of your own journey. And that's okay -- I am not writing this so that we compare ourselves to each other, but rather, to rejoice in the fact that these revelations are being shared in stages throughout all of our lives. In fact, I am beginning to see clearly just how far the Body of Christ has come in knowing Jesus ... and how far we have to go. So, I'm going to try to express my latest revelations in easy-to-understand premises, and then unpack it all to share why it is important that we not lose our fear of God. Here is the new discernment that I have received, and while it may not seem earth-shattering at first, when I looked at the implications of it, I was actually astounded ... Let's start here: We should be able to acknowledge that Jesus existed as God before His birth to the virgin Mary. And while the Body of Christ is coming into a fuller understanding that Jesus experienced everything on earth as a human being -- at no time did He invoke His privileges as Deity to deal with demons, disease, or difficulties with man -- He has now returned to His original identity as God, seated on His throne at the right hand of the Father. So here's what I found so amazing: Out of all the immense vastness of infinite time, those three-and-a-half years spent as a man changed the dynamic of everything that came before and all that has come, and will come after. BUT ... and here is where we must be careful in our discernment; we cannot become stuck on the image of Christ as a man, and must now [more than ever] see Him in His fullness and greatness as Deity. While we honor Him as our Redeemer and Deliverer, I'm afraid we may cling to an image of Him as He was on earth -- the precious baby in the manger; the prophet and teacher who performed signs and wonders as God; the sinless man who was willing to die to save us from the wrath of Almighty God. True, He was all that and more! But He is greater than He was while on earth, and we must respond to Him as Supreme Creator of all (1 Corinthians 1:16-17); King of Kings (Revelation 17:14); Mighty God and Everlasting Father (Isaiah 9:6); and Righteous Judge (Acts 10:42)! Because, you see, as John says in the first chapter of his Book, Jesus was God. 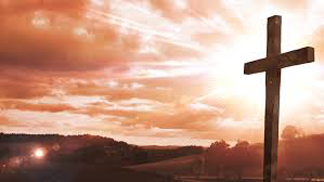 And He loved the world so much that He sent a part of Himself to earth to live as a man, not only so that He could identify with our struggles, but also as the payment due God for our sins. God established in Leviticus 20:26, "You are to be holy to Me; for I the Lord am holy, and have set you apart from the peoples (nations) to be Mine". This was spoken to the nation of Israel, but Peter reiterates it to the Early Church, who are our ancestors in the Faith, "But as He who called you is holy, you also be holy in all your conduct, since it is written, “You shall be holy, for I am holy.” He then goes on to say, " If you address as Father, the One who impartially judges according to each one’s work, [then] conduct yourselves in [reverent] fear [of Him] and with profound respect for Him throughout the time of your stay on earth" (1 Peter 1:15-17). We must discern that God takes sin very seriously, and that Jesus [who is called Everlasting Father in Isaiah 9:6] will be the One who judges us! And here is where it all comes together.... In John 1:21-22, the Apostle makes God's position clear: Just as the Father raises the dead and gives them life [and allows them to live on], even so the Son also gives life to whom He wishes. For the Father judges no one, but has given all judgment [that is, the prerogative of judging] to the Son [placing it entirely into His hands]... And here is where the Modern Church has been tempted to be deceived. How many of you have spent your church lives under the teaching that we are no longer under the Law, but under God's Grace? That is certainly true, but do we know the full implication of that premise? John 1:16-17 says, For from His fullness we have all received, grace upon grace. For the law was given through Moses; grace and truth came through Jesus Christ. We must first understand that God's grace abounded under what we commonly call the Old Covenant in the Old Testament. (I have come to understand that the covenants found in the Pentateuch are principally agreements made between God and the Biblical Israelites, while the covenant He made with Noah applies to all of humanity and to all other living creatures. In this covenant, God promises never again to destroy all life on Earth by flood and creates the rainbow as the sign of this "everlasting covenant between God and every living creature of all flesh that is on the earth"). Back to the premise that grace was evident in the Old Testament... the Bible abounds with examples of God's grace. I think we can all agree with A.W. Tozer, who says that grace is “the good pleasure of God that inclines him to bestow benefits on the undeserving.” It was certainly the case with Adam and Eve, who received grace after sinning in the Garden. And how many times were the Israelites disobedient to God's commands as they came into the Promised Land? Yet, He continued to offer them His grace. King David is another good example. He killed Uriah, and lusted after his wife, yet God called him "a man after His own heart". And Jacob, who cheated Esau out of his inheritance was a man that God declared He loved, while Esau, He hated. So, we cannot deny that God's grace existed in the Old Testament under the covenants He held with the Israelites. Here's what we need to understand about Grace in the Old Testament.... It did not set you free from the consequences of sin. In fact, sin had dominion over the people because the Law of Moses couldn't do what Jesus did; it couldn't set us free! Death was often the consequences of your sin under the Law of Moses. For instance, any Israelite who offered their children as sacrifice to Molech was to be put to death; anyone who cursed their mother or father, or committed adultery, or any number of sexual perversions were all to be put to death. And King David certainly suffered the consequences of his sin, with the death of his son with Bathsheba. Sin had sovereignty over one's life. But Jesus's sacrifice on the Cross proved to be greater than the Law for setting us free from sin, and offered man a greater concept of God's Grace. So, what is different about the Grace offered in the New Testament? This [New] Covenant of Grace is where God promises eternal salvation to Man based upon the sacrifice of Jesus on the cross. Blood sacrifices in the Old Testament [where the High Priests used the blood of animals] could not take away our sins. It only cleansed the outer man, and that's why they had to be done every year. Jesus is now our High Priest and is greater than the Priests who were under the Law, and who died and had to be replaced. He is eternal and He never dies. And we understand that His sacrifice was "one time for all", and with His own blood. His blood has the power to forgive everyone on earth, and we are now under the Blood. But here is the danger of deception in the understanding of God's Grace versus the Law. Yes, we are forgiven our sins, and we no longer have to worry that we could be put to death if we sin. We confess our sin, repent, and ask for God's forgiveness. BUT, we must not forget that God, from the beginning, has called us to be holy, as He is Holy. That why Paul warns in Romans 6, "we can [not] go on sinning so that God's grace abounds". 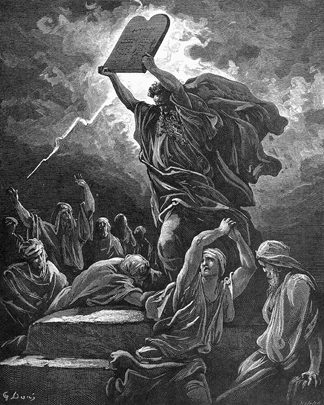 In fact, the writer of Hebrews warns, "For if the message given through angels [the Law given to Moses] was authentic and unalterable, and every violation and disobedient act received an appropriate penalty [death], how will we escape [the penalty] if we ignore such a great salvation [the gospel, the new covenant]"? (Hebrews 2:2-3). Remember, Jesus is greater than the angels, greater than Moses, greater than the High Priests of old. So, here is what I am afraid the Modern Church has ignored in Scripture; a passage that should have every Christian examining themselves to see if they are living a holy life ... and what is plainly declared in Hebrews 10:26-31: "For if we go on willfully and deliberately sinning after receiving the knowledge of the truth, there no longer remains a sacrifice [to atone] for our sins [that is, no further offering to anticipate], but a kind of awful and terrifying expectation of [divine] judgment and the fury of a fire and burning wrath which will consume the adversaries [those who put themselves in opposition to God]. Anyone who ignored and set aside the Law of Moses [was] put to death without mercy on the testimony of two or three witnesses. How much greater punishment do you think he will deserve who has rejected and trampled under foot the Son of God, and has considered unclean and common the blood of the covenant that sanctified him, and has insulted the Spirit of Grace [who imparts the unmerited favor and blessing of God]? For we know Him who said, “Vengeance is Mine [retribution and the deliverance of justice rest with Me], I will repay [the wrongdoer].” And again, “The Lord will judge His people.” It is a fearful and terrifying thing to fall into the hands of the living God [incurring His judgment and wrath]". I'm afraid the Church thinks we are under Grace and we won't be punished like the people of God were under the Old Covenant and the the Law of Moses. But that is not what the aforementioned verses in Hebrews says! We should understand that Jesus is so much more in Heaven than He was while on earth! Yes, He is our Mediator and Advocate, but we cannot ignore Luke 12:10, which says, "And everyone who speaks a word against the Son of Man will be forgiven, but the one who blasphemes against the Holy Spirit will not be forgiven". This is affirmation of what is declared in Hebrews 10... the one who insults the Spirit of Grace [who is the Holy Spirit who imparts God's grace to us] will be repaid with vengeance by the Lord. We have ample evidence of what that looks like in the lives of Ananias and Sapphira when they lied to the Holy Spirit in Acts. I know there will be those who accuse me of being legalistic and corrupting the concept of Grace according to the Church. But a complete and exhaustive study of the Book of Hebrews will give you a more accurate understanding of what Scripture says, instead of following Church culture. And I am NOT saying that if you are sincerely trying to live a righteous and holy life and encounter struggles, which result in confession and repentance, that you will suffer vengeance by the Lord. 1 John 1:9 shows the heart of God and Jesus: If we confess our sins, He is faithful and just to forgive us our sins and to cleanse us from all unrighteousness. But if you are a Christian that is indifferent or callous towards your own sin, thinking you have nothing to worry about because we are under the new covenant of Grace, then I would suggest that you examine your attitude and see if you willfully and deliberately continue to sin, without any consideration of consequences, or just because you think all you have to do is continue to ask for forgiveness and it will be yours. And I would recommend you take to heart Psalm 25:14: The friendship of the Lord is for those who fear him, and he makes known to them his covenant. In conclusion, I just want us to be aware that the fear of the Lord is not only awesome reverence for who He is and what He has done for us, but should be seriously considered if we, who have received that knowledge of Truth [of eternal salvation due to His sacrifice for us] should willfully and deliberately continue to sin. For Scripture very clearly states that there is no further atonement to be made for us, and there is a terrifying expectation of divine judgment. Just as Jesus is greater than the Law of Moses, so is the punishment greater for us than it was under the Law. This is the undeniable truth of Scripture and no amount of 21st Century Church doctrine or softening of the language can negate the Word of God. That is why we should all work out our salvation with fear and trembling (Philippians 2:12). It is a process, and your eternal life [and my Lord] are worthy of this admonition. 2 Corinthians 7:1 "Since we have these promises, beloved, let us cleanse ourselves from every defilement of body and spirit, bringing holiness to completion in the fear of God". I have literally felt this for quite some time, Pam. The New Testament clearly stresses the meaning of fear. Sadly, society has become complacent in accepting that faith alone leads to salvation. In reality, it’s is selfish to think that we are entitled to Gods grace, simply for believing in Him. This is no different than the current “Coexist” movement which accepts every religion and shuns all forms of rebuke. Another method used by Satan, to lower our defenses and open ourselves to sin with no fear of repercussions.